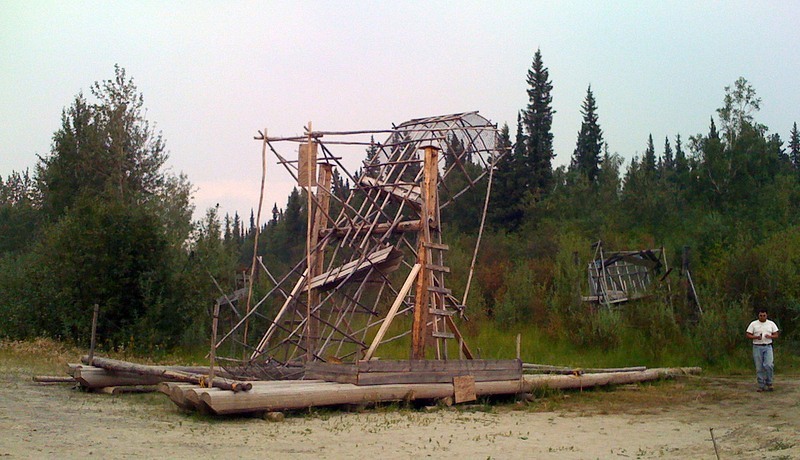 A fish wheel is a water-powered device used for catching fish, particularly adult salmon, and consist of a revolving wheel with baskets and paddles attached to its rim. 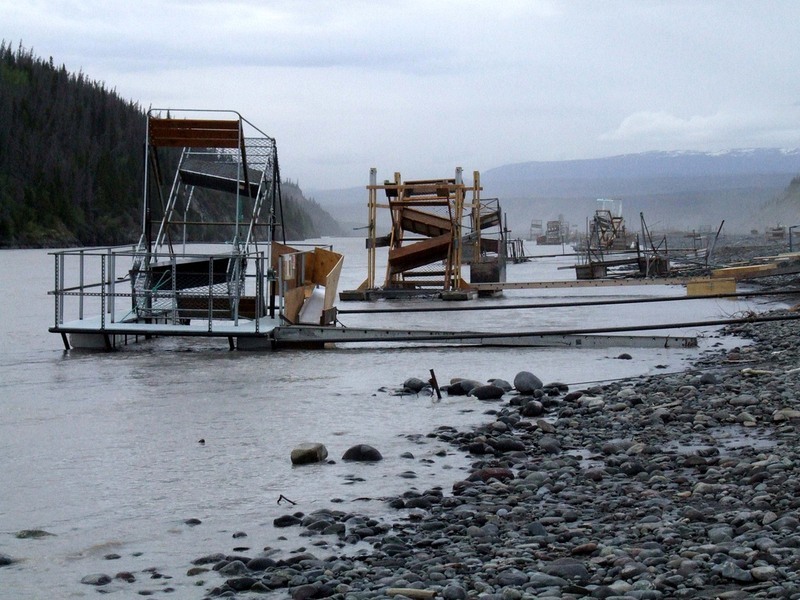 When the wheel is floated on the river, the river current turns the wheel causing the baskets to scoop down upon the salmon traveling upstream and lift them out of the water. Once out of the water, the basket's tilted bottom channels the fish out of an opening and into a hopper on board the floating dock. The ingenious device can catch large amounts of fish and the best part is that the fishermen doesn’t even have to be there. One fish wheel operating in Columbia River in the early 20th century reportedly pulled out half a ton of salmon daily. 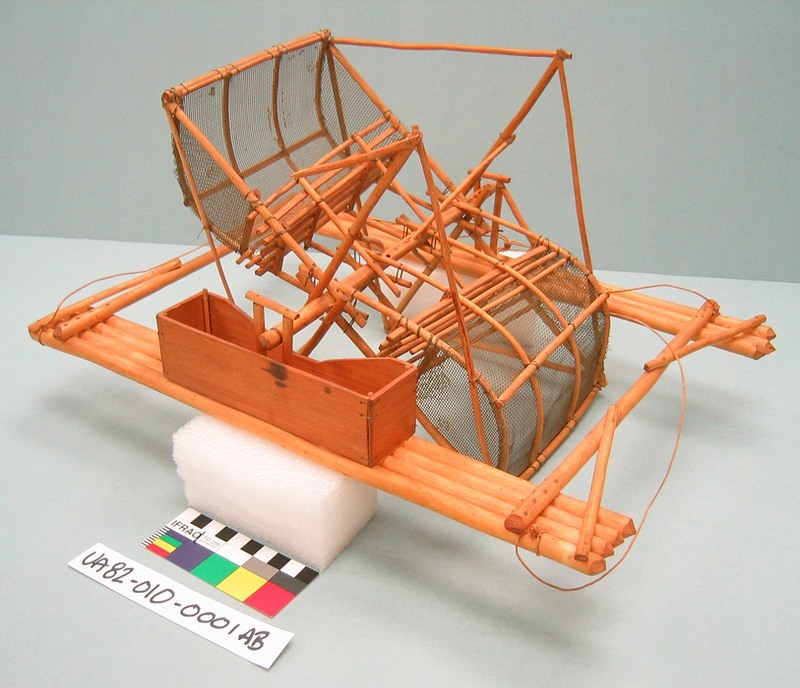 Indeed, fish wheels were so effective as a fish catching device that they were banned in the United States because they threatened the salmon population. 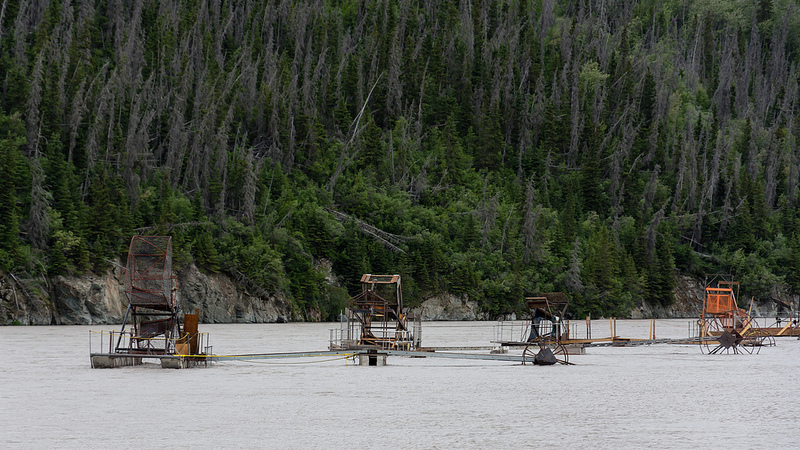 Fish wheels for commercial fishing is only allowed in Alaska along the Copper River and the Yukon River. It’s not known who first started using fish wheels, but they may have been invented in China. Fish wheels have been used in the past in Japan, in France on the Garonne, and in Rome the Tiber. They were first used in the United States in North Carolinian in 1829, but their major deployment was on the Columbia River by the late 1870s where they became tremendously effective at landing upstream migrating salmon. One single fish wheel near The Dalles, pulled 418,000 pounds of salmon out of the river in 1906 alone, and it was just one of more than 75 fish wheels working the river that year. 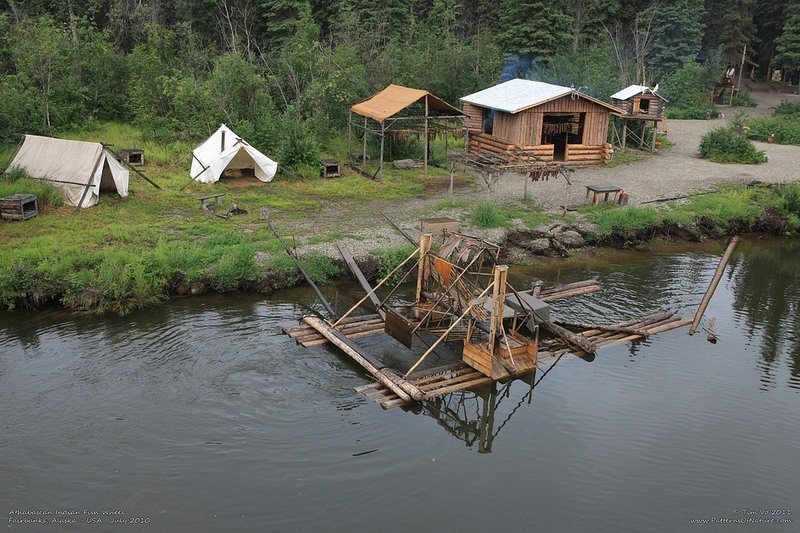 As the early 1900s wore on, the river’s salmon population started to dwindle and a conflict arose between fish wheel operators and competing fishers using traditional fishing methods. Downriver commercial fishers blamed fish wheel owners for exhausting the river’s salmon fishery and fought for their removal through the legal system. In the 1908 Oregon election, the two sides sponsored competing ballot measures, one banning fish wheels and the other making gill nets illegal. 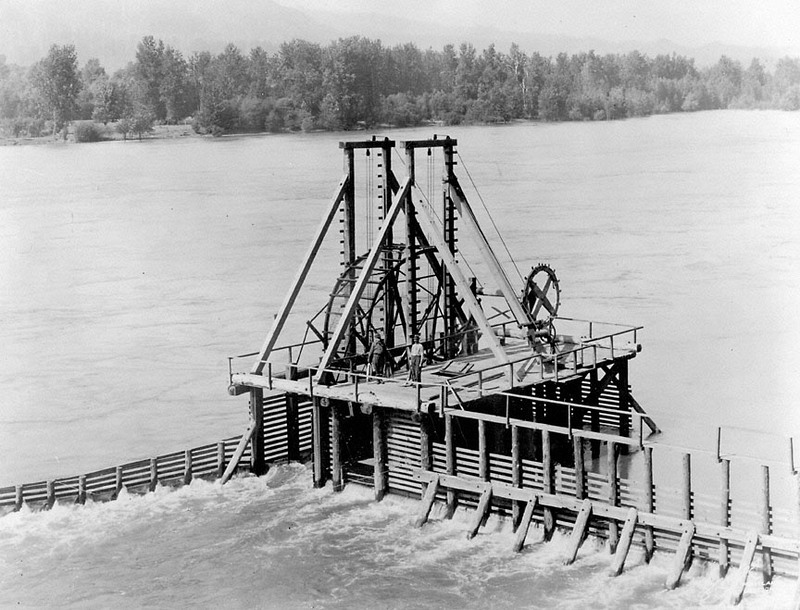 Fish wheel operations on the Columbia were finally banned in 1928, in Oregon, and 1935 in Washington. The fishing industry suffered another blow when the Grand Coulee Dam was built without fish ladders, cutting off a lot of fish from their spawning grounds. 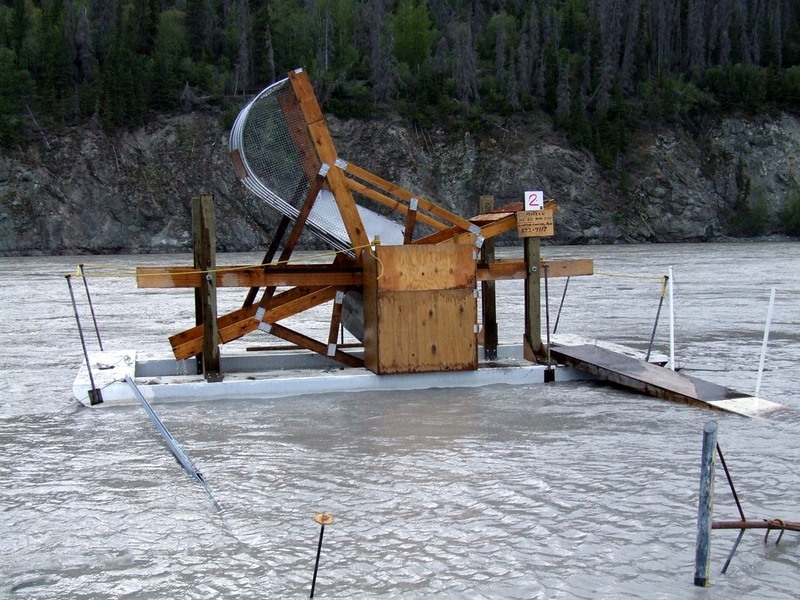 Today fish wheels can’t be used commercially in many places in North America, but they are ideal for researchers monitoring fish populations. The baskets scoop fish out of the water without snaring or hooking them, thus keeping them unharmed. Once on the deck, they can be measured, weighed, tagged, and released. 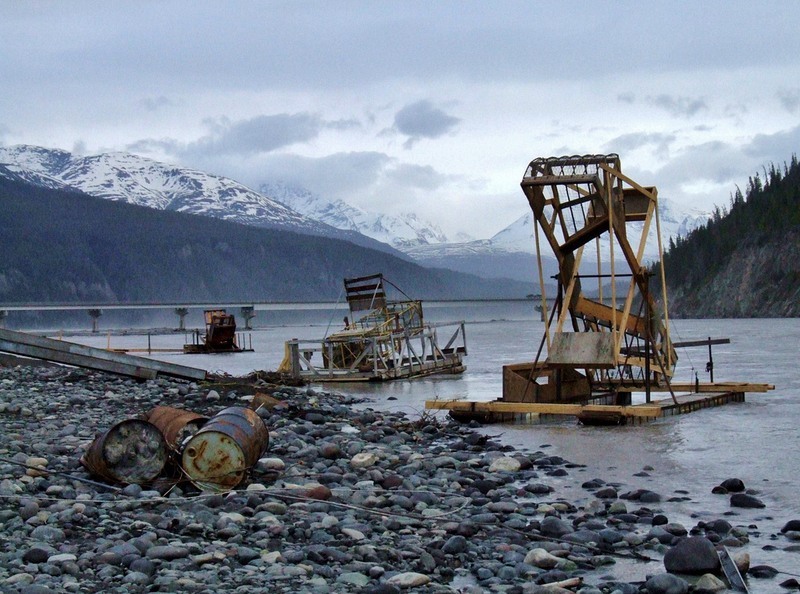 Fish wheels may be making a comeback as a commercial fishing technique, because unlike many alternative gear types, such as gill nets, that kill much of what is caught, fish-wheel keep their catch alive in holding pens where they may be sorted, and the protected fish returned to the river unharmed. Video of a fish wheel in operation.